Scientists must speak out about the benefits of new genetic technologies such as genetically modified organisms (GMOs) and gene editing, according to The University of Queensland's new Director of Crop Science, Professor Ian Godwin. He hopes the book will help end fear and misinformation generated by "fake news" about the safety of genetically modified foods. "The future of billions of people literally depends on changing the narrative about how we view genetically modified food and genetic technologies," Professor Godwin said. "If we are to produce more sustainable and nutritious food to meet the growing global demand – in the face of challenges from pests and diseases, eroded soils, lack of water and climate change – we need to be able to take the best from the latest genetic technologies and from organic and agro-ecological farming practices." With 30 years' experience in agribiotechnology across crops ranging from sorghum, wheat and barley to beans and taro, Professor Godwin calls genetic technologies – such as CRISPR gene editing – a biological revolution. "Genetically modified, or GM, crops use 37 per cent less pesticide, and increase crop yields by 22 per cent and farmer profits by 68 per cent – and the promise of new genome editing techniques is simply astonishing," Professor Godwin said. "But we have to stop pretending that 'natural is best' and challenge the notion that organic food companies are not actually big global companies with a conflict of interest when it comes to the GMO debate." Sir Gordon Conway – author of One Billion Hungry: Can We Feed the World? – has described Good Enough to Eat? as "a lively dialogue" that tackles the "highly vociferous and unprincipled opposition from some sectors of the public who choose to ignore facts and realities" about GM food. 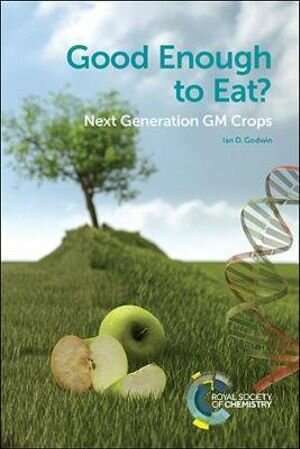 "Ian Godwin is a first-class scientist and his book gives us answers how food can be grown and engineered to meet one of the world's most important challenges," Professor Conway said. In the book, Professor Godwin describes his experiences eating some of the world's first gene-edited cabbage, prepared by Sweden's Chef of the Year 2010 Gustav Tradgårdh; a horror story working with celery; and his time as part of a sorghum and cotton team in Biloela in Central Queensland, where locals rushed to get washing inside before crop dusters flew overhead and dumped huge amounts of endosulfan and other chemicals on crops. "In those days in peak season, spraying was happening every day in any given region, and some growers were spraying their crops up to 17 times per growing season to ward off caterpillars – but now GM cotton has reduced the need to spray for insects to once or twice per season." "This is an exciting and challenging time for agriculture and the bio-economy," Professor Godwin said. "Our focus will continue to be on improving crop productivity, food quality and sustainability in the crop sciences, and we will use every safe, effective and innovative tool in the toolbox to do so." The only problem with GMO crops is creepy corporations like Monsanto using their patent monopolies to reduce farmers to serfdom. A tight web of regulation around these companies is needed, and hard limits on patent periods. Seven years seems about right. The only problem with GMO crops is creepy corporations like Monsanto using their patent monopolies to reduce farmers to serfdom. As opposed to the really creepy global organic food companies that may or may not have incorporated, and may or may not have monopolies by shutting out GMO? Or the fact that any farmer will earn 68 % if they can choose GMO instead of being "serfed" by anti-GMO sentiments. See, this is not about words but about green food. GMO or even general modern precision farming [MPF] is as green as we have ever done it, and "organic" food is using up natural areas and polluting rivers with nutrient effluents going to waste and harm. GMO is best MPF, only one that cuts pesticides. Exactly. Monsanto and its abuses aside, GMO is probably our best tool to feed the expected ten billion without overwhelming the natural world. Opposition on grounds of nutrition or taste is a silly as opposition to wheat for being bred so far from emmer, or to apples for no longer being tiny and sour.